He leído un artículo que demuestra que las mujeres mandan en Juego de Tronos, ¿Te lo habías planteado? Aunque al comienzo de la serie las mujeres apenas tienen poder, las cosas han cambiado mucho a lo largo de estas siete temporadas. Olvídate de la Guerra de los Cinco Reyes, las Reinas son las que mandan. Ellaria y Yara fueron capturadas al final del segundo episodio y llevadas ante Cersei Lannister que quemó a la mayoría de sus enemigos, tomando el trono de una forma espectacular, pero aún tiene que enfrentarse a duras enemigas como Sansa, que acaba de conseguir el control del Norte y Arya, ahora una despiadada asesina. No se sabe quién se sentará definitivamente en el Trono de Hierro pero es probable que sea una mujer. El sustantivo “principe” en Alto Valyrio no tiene género, así que será un Príncipe o una Princesa quién traerá “el alba”. 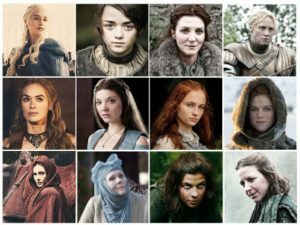 I read an article that shows that women run the world in Game of Thrones, have you thought about it? Although at the beginning of the series, women hardly have power, things have changed a lot during these seven seasons. Forget the War of Five Kings, the Queens are the ones that rule. Daenerys Targaryen has a huge army and three dragons and has just started the conquest of Westeros. Several women participated in his council of war, such as Yara Greyjoy, who aspires to be queen of the Iron Islands and Ellaria Arena, who deposed the government of Dorne and Olenna, queen of thorns, who in a conversation with Daenerys claims to have known many clever men and have survived them all and their secret is "I ignored them"
Ellaria and Yara were captured iat the end of episode two and taken to Cersei Lannister who burned most of his enemies, taking the throne in a spectacular way, but still has to face tough enemies like Sansa, who has just gained control of the North and Arya, now a ruthless killer. It is unclear who will finally sit on the Iron Throne but it is probably a woman. The noun "prince" in Alto Valyrio has no gender, so it will be a Prince or a Princess who will bring "the dawn".